More than a mere renaissance man, Jefferson may actually have been a new kind of man. He was fluent in five languages and able to read two others. He wrote, over the course of his life, over sixteen thousand letters. He was acquainted with nearly every influential person in America, and a great many in Europe as well. He was a lawyer, agronomist, musician, scientist, philosopher, author, architect, inventor, and statesman. Though he never set foot outside of the American continent before adulthood, he acquired an education the rivaled the finest to be attained in Europe. He was clearly the foremost American son of the Enlightenment. Jefferson was born at Shadwell in Albemarle county, Virginia on April 13, 1773. He was tutored by the Reverend James Maury, a learned man, in the finest classical tradition. He began the study of Latin, Greek, and French at the age of nine. He attended William and Mary College in Williamsburg at sixteen years old, then continued his education in the Law under George Wythe, the first professor of law in America (who later would sign Jefferson’s Declaration in 1776). Thomas Jefferson attended the House of Burgesses as a student in 1765 when he witnessed Patrick Henry’s defiant stand against the Stamp Act. He gained the Virginia bar and began practice in 1769, and was elected to the House of Burgesses in 1769. It was there that his involvement in revolutionary politics began. He was never a very vocal member, but his writing, his quiet work in committee, and his ability to distill large volumes of information to essence, made him an invaluable member in any deliberative body. In 1775 when a Virginia convention selected delegates to the Continental Congress, Jefferson was selected as an alternate. It was expected that Payton Randolph, (then Speaker of the Virginia House and president of the Continental Congress too,) would be recalled by the Royal Governor. This did happen and Jefferson went in his place. Thomas Jefferson had a theory about self governance and the rights of people who established habitat in new lands. Before attending the Congress in Philadelphia he codified these thoughts in an article called A Summary View of the Rights of British America. This paper he sent on ahead of him. He fell ill on the road and was delayed for several days. By the time he arrived, his paper had been published as a pamphlet and sent throughout the colonies & on to England where Edmund Burke, sympathetic to the colonial condition, had it reprinted and circulated widely. In 1776 Jefferson, then a member of the committee to draft a declaration of independence, was chosen by the committee to write the draft. This he did, with some minor corrections from James Madison and an embellishment from Franklin, the document was offered to the Congress on the first day of July. The congress modified it somewhat, abbreviating certain wording and removing points that were outside of general agreement. The Declaration was adopted on the Fourth of July. Jefferson returned to his home not long afterward. His wife and two of his children were very ill, he was tired of being remote from his home, and he was anxious about the development of a new government for his native state. In June of 1779 he succeeded Patrick Henry as Governor of Virginia. The nation was still at war, and the southern colonies were under heavy attack. Jefferson’s Governorship was clouded with hesitation. He himself concluded that the state would be better served by a military man. He declined re-election after his first term and was succeeded by General Nelson of Yorktown. In 1791 he retired to Montecello, the estate he inherited, to write, work on improved agriculture, and attend his wife. It was during this time that he wrote Notes on the State of Virginia, a work that he never completed. Mary Jefferson died in September of 1782. This event threw Jefferson into a depression that, according to his eldest daughter he might never have recovered from. Except that Washington called on him in November of 1782 to again serve his country as Minister Plenipotentiary to negotiate peace with Gr. Britain. He accepted the post; however it was aborted when the peace was secured before he could sail from Philadelphia. In 1784 Jefferson went to France as an associate Diplomat with Franklin and Adams. It was in that year that wrote an article establishing the standard weights, measures, and currency units for the Untied States. He succeeded Benjamin Franklin as Minister to France the following year. When he returned home in 1789, he joined the Continental Congress for a while, and was then appointed Secretary of State under George Washington. This placed him in a very difficult position. The character of the executive was being established during the first few terms. Jefferson and many others were critical of the form it was taking under the first Federalist administration. Jefferson was sharply at odds with fellow cabinet members John Adams and Alexander Hamilton, both of whom he found to be too authoritarian and too quick to assume overwhelming power for the part of the executive. He resigned from the cabinet in 1793 and formed the Democrat-republican party. Heated competition continued. Jefferson ran for president in 1796, lost to John Adams, and, most uncomfortably, this made him vice president under a man whom he could no longer abide. After a single meeting, on the street, the two never communicated directly during the whole administration. Jefferson again ran for the presidency in 1801 & this time he won. He served for two terms & he did ultimately play a deciding role in forming the character of the American Presidency. The 12th amendment to the Constitution changed the manner in which the vice president was selected, so as to prevent arch enemies from occupying the first and second positions of the executive. Jefferson also found the State of the Union address to be too magisterial when delivered in person. He performed one and afterwards delivered them, as required by the constitution, only in writing. He also undertook the Louisiana Purchase, extending the boundaries of the country and establishing the doctrine of manifest destiny. 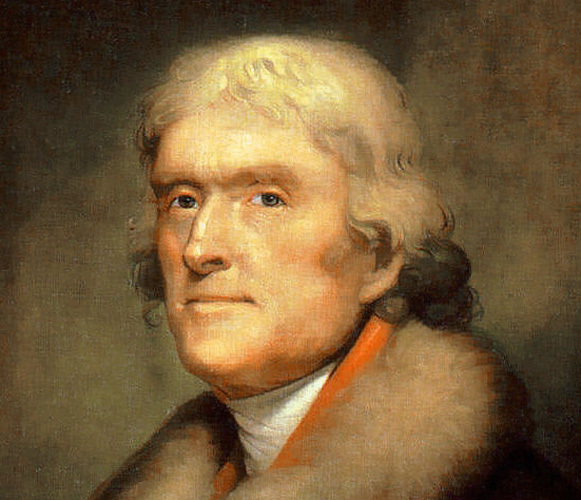 Thomas Jefferson retired from office in 1781. He continued the private portion of his life’s work, and sometime later re-engaged his dearest & longest friend James Madison, in the work of establishing the University of Virginia. In 1815 one of his projects, a Library of Congress, finally bore fruit, when he sold his own personal library to the congress as a basis for the collection. Shortly before his death in 1826, Jefferson told Madison that he wished to be remembered for two things only; as the Author of the Declaration of Independence, and as the founder of the University of Virginia. Jefferson died on the 4th of July, as the nation celebrated the fiftieth anniversary of his splendid Declaration.